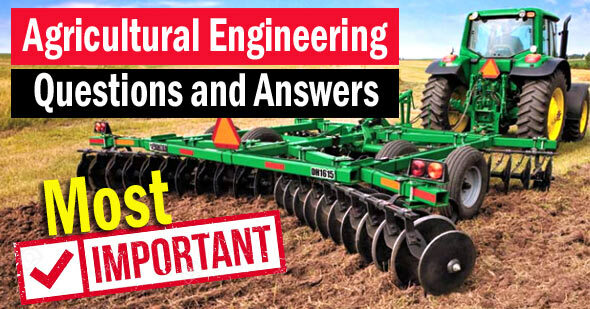 Agricultural Engineering Questions MCQ - Dear Aspirants, Most important Agricultural Engineering Objective Questions and Answers useful for General Agriculture for preparation of SRF, ARS, Ph.D., M.Sc. IBPS, AFO, AO, IFS, NABARD, SSC, Banks, IBPS, CAT-MAT, Railways, Police & many more competitive examinations & entrance tests. (A) 33 ft. (B) 66 ft.
(C) Compression ratio (D) B. M. E. P.
(C) 1440 rev/min. (D) 2000 rev/min. 41. A combine harvestor with 4 m cutter bar and 4 km/hr speed of operation will harvest ha/hr.